Perseus molecular cloud from IC348 to NGC1333. 6 hours of exposure (36x10minutes) with Canon 6d modified and TS71 scope at f5. This cosmic expanse of dust, gas, and stars covers some 6 degrees on the sky in the heroic constellation Perseus. At upper left in the gorgeous skyscape is the intriguing young bluish star cluster IC 348 and neighboring Flying Ghost Nebula. At right, another active star forming region NGC 1333 is connected by dark and dusty tendrils on the outskirts of the giant Perseus Molecular Cloud, about 850 light-years away. 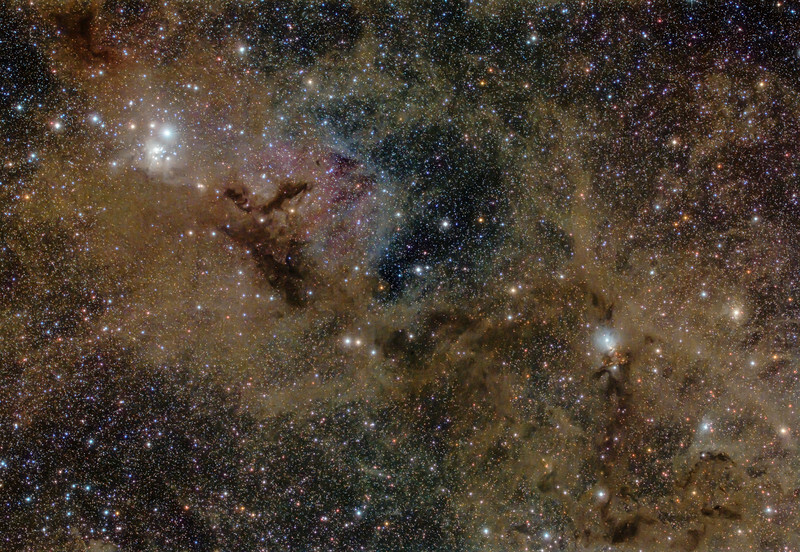 Other dusty nebulae are scattered around the field of view, along with the faint reddish glow of hydrogen gas. In fact, the cosmic dust tends to hide the newly formed stars and young stellar objects or protostars from prying optical telescopes. Collapsing due to self-gravity, the protostars form from the dense cores embedded in the dusty molecular cloud. At the molecular cloud's estimated distance, this field of view would span almost 90 light-years. (Text courtesy of NASA APOD). Image taken by Lynn Hilborn, WhistleStop Obs, Grafton, Ontario on September 17 and 23, 2015. This image was NASA Astronomy Photo of the Day October 10, 2015.